Activyl TickPlus Spot-On for Large Dogs is indicated for the prevention and control of flea and tick infestations in large breed dogs weighing 20.1-40kg. Each 4ml pipette delivers Indoxacarb 600mg and Permethrin 1920mg. 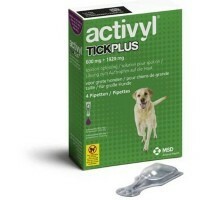 Activyl TickPlus can be used as part of a treatment strategy for the control of Flea Allergy Dermatitis (FAD). Please enter the quantity as per your prescription into the “quantity” box.